Marisha Pessl’s dazzling debut sparked raves from critics and heralded the arrival of a vibrant new voice in American fiction. 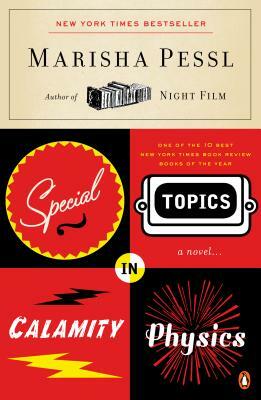 At the center of Special Topics in Calamity Physics is clever, deadpan Blue van Meer, who has a head full of literary, philosophical, scientific, and cinematic knowledge. But she could use some friends. Upon entering the elite St. Gallway School, she finds some—a clique of eccentrics known as the Bluebloods. One drowning and one hanging later, Blue finds herself puzzling out a byzantine murder mystery. Nabokov meets Donna Tartt (then invites the rest of the Western Canon to the party) in this novel—with visual aids drawn by the author—that has won over readers of all ages. Marisha Pessl is the author of Night Film and Special Topics in Calamity Physics, her bestselling debut, which was awarded the John Sargent Sr. First Novel Prize (now the Center for Fiction’s Flaherty-Dunnan First Novel Prize) and selected as one of the 10 Best Books of the Year by The New York Times Book Review. She lives with her husband and daughter in New York City.